I’m visiting a sister in D.C. and visited the National Gallery of Art for the umpteenth time; caught a small exhibit yesterday that officially opens today that has an item of interest. The exhibit is “Sharing Images: Renaissance Prints Into Maiolica and Bronze,” April 1 – August 5, 2018. 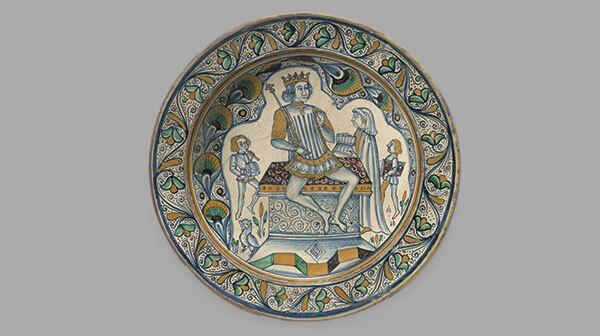 The item in question has an accompanying placard that merely says it is from Deruta or Faenza and that the subject is a “Dish with Petrarch and King Charles IV” (presumably that guess comes from Jamie Gabbarelli, assistant curator of prints, drawings, and photographs at the Rhode Island School of Design Museum, whose comments on the NGA exhibit are on the official webpage here: https://www.nga.gov/exhibitions/2018/sh ... onze.html). The dish is displayed side by side with the E-Series (ES) source material of the original Re card (as are all objects paired with their print source in this exhibit). The presumed curator’s comments are clearly wrong: the Emperor was available in the ES tarocchi if the Holy Roman Emperor was intended (while not exactly familiar from the VS decks, the tarochhi Emperor does exhibit the orb, beard and eagle - the last is actual, not heraldic, such as we usually find on a jousting shield or his hat). And the Re/King card need not refer to Aragon or France or any other actual king, as crowned figures in tarot proper often refer to a ducal crown (which would be appropriate for the d’Este of Ferrara, for instance). I have no idea where the dating came from other than the assumption that the dish followed closely upon the printing, but that is not necessarily so….yet fashion can be fickle so perhaps a decade or a generation separating the two objects is not unreasonable. Of course the CVI also consumes our interest so the dating here is crucial, but unsolvable. Having identified the obvious main subject of the dish, the ancillary figures flanking the king are what is truly interesting. I will argue that the allegory is fairly straight forward: the king is turning away from the left figure holding drum and horn (the social entertainment of music) and turning the other way to receive a literary work from a humanist on the right; ergo, the king’s preference for the contemplative life over the active life – the medieval motif transferred to the realm of a renaissance ruler’s conceit. But what are the sources for the flanking figures, for they were not taken from the tarocchi series? That in itself testifies to how the ES tarocchi were received: a novel series that had no tradition behind it and could be modified/embellished without controversy. The jester-like musician playing horn/pipe and drum, does have a parallel in the traditional tarot corpus, particularly the Bolognese Fool card, differing from the dish example only in that the dish entertainer has no feathers. It does match the headdress of the Merchadante, who is doing a humanist-like activity of at least reading. Perhaps a dig then by the ES tarochhi (not the dish) at Florentines, lesser than Venetian patricians, who more resembled the gentleman and knight? 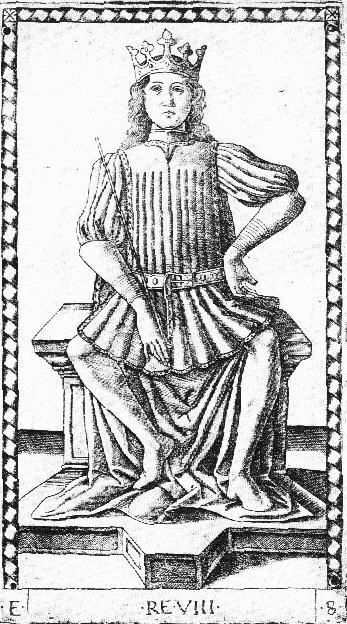 The proposed time period for the ES tarochhi was of extreme enmity between Florence/Milan and Venice/Ferrera/Colleoni (i.e., the failed Pitti coup of 1466 backed by the d'Este and then a repeat attempt in 1467, lead by the Venetian coalition’s Bartolomeo Colleoni, himself the recipient of VS decks...but perhaps now receiving Venetian/Ferrarese ES tarocchi? ).